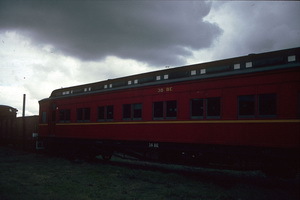 Originally the class consisted of 33 members, but this was later expanded due to conversion of AE to BE's and a further addition to the overland stock. 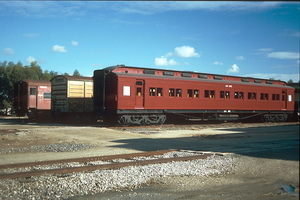 Dimensionally they identical to the AE stock except that they held 72 passengers in nine compartments each 6 inch ¾ inch long. 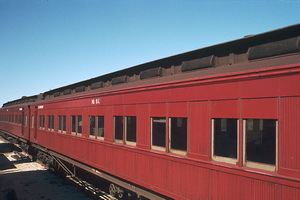 The extra compartment begin located in the non-smoking portion of each carriage. 31 cars were built Newport between 1906 and 1910 for Victorian Railways service, 6 V&SAR Joint Stock at Islington in 1906-1907 and an additional 4 V&SAR Joint Stock in 1922-23. The numbering of the cars was as follows 1-4 VR, 5-10 V&SAR JS, 11-39 VR, 40-43 V&SAR JS and 44-48 VR (converted BDSE cars). Making a total of 48 cars. Four air conditioned AE cars were renumbered 49 BE thru 52 BE. 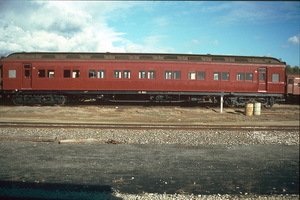 Five of the original BDSE (Travelling Post Office Cars - TPO) were converted to BE configuration during 1922-23. Original weight 34 tons 11 cwt, after strengthened underframes and anti-telescoping members weight 36 tons 3 cwt. After air conditioning, 4 BE, 31 BE, 4 BE and 19 BE weight 44 tons 10 cwt. 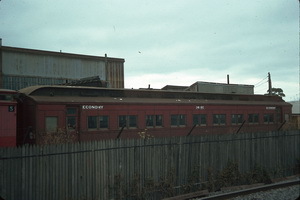 In 1982 the ABE class cars which had been altered to 53 BE thru 61 BE were recoded BES as they had one less compartment than a standard BE. 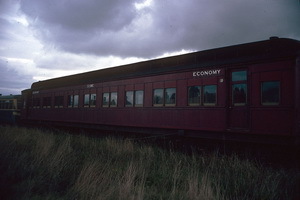 Former ESBV class bulk mail vans which had been converted to BE class about 1929 were also recode as BEL. This was to conform with a new computerised booking system. 28.08.1906 Issued to service after being built by the Victorian Railways Newport workshop. 4.10.1981 Still in service V/LINE. 5.1986 In posession of The Seymour Loco Group. 5.1986 In posession of Steamrail Victoria. 30.10.1906 Issued to service after being built at the Victorian Railways Newport workshop by contractor "Herbert and party". 30.10.1906 Issued to service after being built at the Victorian Railways Newport workshop by contractor "Robertson and party". 28.1.1938 Fitted with stones electro-mechanical air conditioning and automatic couplers. 8.1961 Fitted with Spirit of Progress bogies. 27.6.1983 Oushopped with upgraded interior. 1986 Refurbished with new cloth upholstery, new carpet and painted in blue and gold. 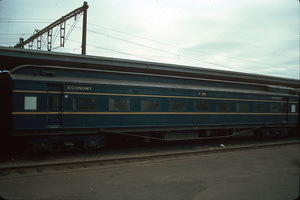 Second class compartment seating car for use on The Overland. 22.10.1907 Issued to service after being built at the South Australian Railways Islington workshop. 3.4.1976 Scrapped by V/LINE at Newport Workshops. 5.4.1976 Scrapped by V/LINE at Newport Workshops. 29.10.1907 Issued to service after being built at the South Australian Railways Islington workshop. 26.5.1959 Damaged beyond repair in wreck and scrapped in South Australia. 27.12.1929 Destroyed at Callington in collision. 1.11.1907 Issued to service after being built at the South Australian Railways Islington workshop. 26.3.1976 Scrapped by V/LINE at Newport Workshops. 3.8.1908 Issued to service after being built at the Victorian Railways Newport workshop by contractor "Herbert and party". 26.10.1970 Scrapped at Newport Workshops. 6.6.1984 Sold to a buyer from Bayswater. 15.8.1908 Issued to service after being built at the Victorian Railways Newport workshop by contractor "Robertson and party". 3.5.1976 Extensively damaged by fire at Ballarat. 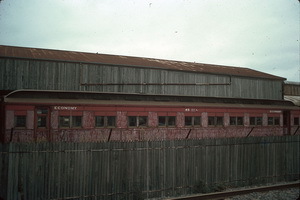 5.11.1976 Scrapped at Ballarat North Workshops. 28.8.1908 Issued to service after being built at the Victorian Railways Newport workshop by contractor "Robertson and party". 26.8.1908 Issued to service after being built at the Victorian Railways Newport workshop by contractor "Mitchell and party". 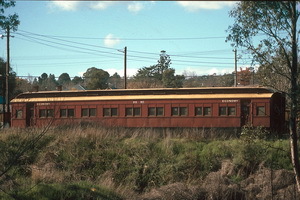 4.7.1984 To Castlemaine and Maldon Railway. 11.1985 Obtained by SteamRanger South Australian. 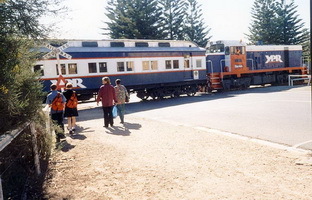 1993 Sold to Kadina to Wallaroo Tourist Railway. 15.8.1908 Issued to service after being built at the Victorian Railways Newport workshop by contractor "Scott and party". 10.4.1935 Fitted with automatic couplers. 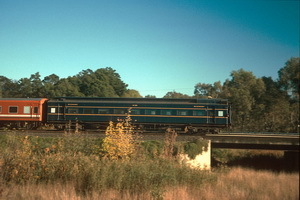 5.1986 In posession of Steamrail Victoria and in use. 30.6.1909 Issued to service after being built by the Victorian Railways Newport workshop. 13.12.1952 Damaged in the Dudley St car sidings fire. Repaired and returned to service. 1.1989 Roof canvas replaced with Fibreglass. 5.10.1909 Issued to service after being built by the Victorian Railways Newport workshop. 13.5.1938 Fitted with stones electro-mechanical air conditioning. 11.1986 Repainted/Overhauled at Bendigo North Workshops. 24.12.1991 Withdrawn and allocated to Great Southern Railway. 10.4.1935 Fitted with automatic cpuplers. 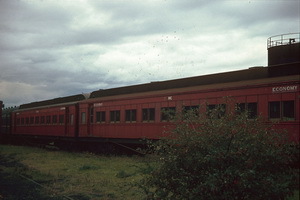 11.1986 In posession of Castlemaine and Maldon Railway. 1.11.1909 Issued to service after being built at the Victorian Railways Newport workshop by contractor "Mitchell and party". 5.10.1909 Issued to service after being built at the Victorian Railways Newport workshop by contractor "Mitchell and party". - Sold to a buyer from Maffra. 16.7.1909 Issued to service after being built at the Victorian Railways Newport workshop by contractor "Cheyne and party". 1.11.1909 Issued to service after being built at the Victorian Railways Newport workshop by contractor "Robertson and party". 5.10.1909 Issued to service after being built at the Victorian Railways Newport workshop by contractor "Robertson and party". 18.8.1981 Withdrawn from service and stored at Newport. 29.1.1982 Scrapped at Newport Workshops. 2.9.1909 Issued to service after being built by the Victorian Railways Newport workshop. 19.5.1972 Scrapped at Newport Workshops. 12.11.1909 Issued to service after being built by the Victorian Railways Newport workshop. 2.9.1909 Issued to service after being built at the Victorian Railways Newport workshop by contractor "Herbert and party". 12.11.1909 Issued to service after being built at the Victorian Railways Newport workshop by contractor "Herbert and party". 27.3.1937 Fitted with stones electro-mechanical air conditioning . 10.1960 Fitted with Spirit of Progress bogies. 16.10.1982 Outshopped fitted with upgraded interior. 4.9.1986 Observed with new cloth upholstery, new carpet, and painted in the classic blue and gold. 24.12.1991 Withdrawn and stripped of airconditioning, electrical equipment and bogies. 14.10.1910 Issued to service after being built at the Victorian Railways Newport workshop by contractor "Robertson and party". 13.12.1952 Damaged in the Dudley St car sidings fire. 15.9.1910 Issued to service after being built at the Victorian Railways Newport workshop by contractor "Robertson and party". - 34 AE and 33 BE were burnt to the frame in the crash at Lindenow. New bodies were built over the following 2 years, but by that stage the Victorian Railways wasn't building E cars. They were rebuilt with W car parts, and this is still quite obvious on 33 BE today. 1933 Reentered service after rebuild. 7.10.1910 Issued to service after being built at the Victorian Railways Newport workshop by contractor "Mitchell and party". 22.6.1938 Fitted with stones electro-mechanical air conditioning. 1.1953 Fitted with automatic couplers. 11.1960 Fitted with Spirit of Progress bogies. 7.10.1983 Fitted with an upgraded interior. 9.10.1910 Issued to service after being built at the Victorian Railways Newport workshop by contractor "Cheyne and party". 20.5.1978 Scrapped at Newport Workshops. 7.10.1910 Issued to service after being built at the Victorian Railways Newport workshop by contractor "Cheyne and party". - Allocated to Plan R.
9.1.1987 Re-allocated to the Seymour Loco Group. 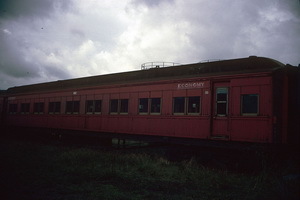 15.6.1988 At Shepparton, interior stripped, windows missing. 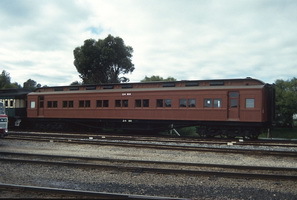 by 1989 Stored at Bendigo for the Bendigo Historical Steam Train Association. 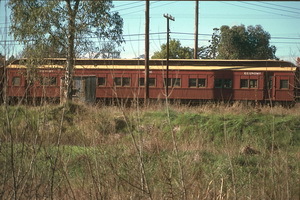 12.1992 Transferred to Seymour via Echuca. 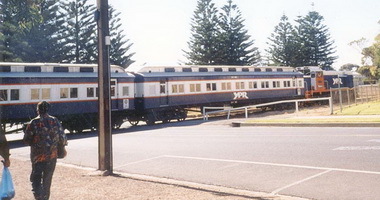 2.7.1993 Delivered to Nyora and the Great Southern Railway. 28.10.1910 Issued to service after being built at the Victorian Railways Newport workshop by contractor "Cheyne and party". 3.12.1910 Issued to service after being built at the Victorian Railways Newport workshop by contractor "Mitchell and party". 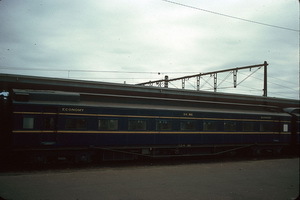 8.1988 In posession of Steamrail Victoria. 19.12.1910 Issued to service after being built at the Victorian Railways Newport workshop by contractor "Mitchell and party". 29.10.1923 Issued to service after being built at the South Australian Railways Islington workshop. - Scrapped at Islington Workshops. - Steel protection panels affixed over the original Tongue and Groove timber exterior (Onkaparinga the only other). 16.4.1975 Entered Mile End Rail Museum South Australia. 7.7.1988 Moved to Port Dock Station Railway Museum. 21.12.1922 Rebuilt to "44 BE". 25.5.1984 Sold to a buyer from Yarragon. 23.5.1923 Rebuilt to "45 BE". 5.1986 In posession of Plan R Victoria. - Transferred to Mornington Railway Preservation Society. 11.12.1923 Rebuilt to "46 BE". - In possession of Seymour Loco group. 23.12.1909 Entered service as bulk mail van coded "5 ESBV"
26.9.1929 Rebuilt to "48 BE".